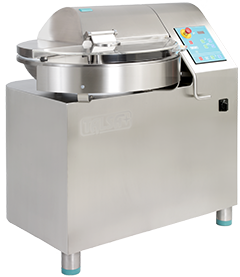 The TALSA K30 Bowl Cutter is designed for the production of sausage hash of all kinds, for small to medium slaughterhouses and industrial meat processors. 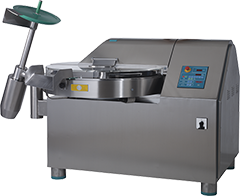 The K30 bowl cutter or bowl chopper is also suitable for a wide range of poultry, fish, pastry or vegetarian products, processed cheese and many commodities in the food processing industry. 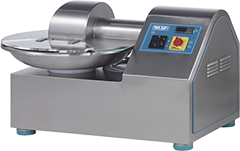 The TALSA K50e Electronic Industrial Bowl Cutter is designed for the production of sausage hash of all kinds, for medium to large slaughterhouses and industrial meat processors. The K50e bowl cutter or bowl chopper is also suitable for a wide range of poultry, fish, pastry or vegetarian products, processed cheese and many commodities in the food processing industry. 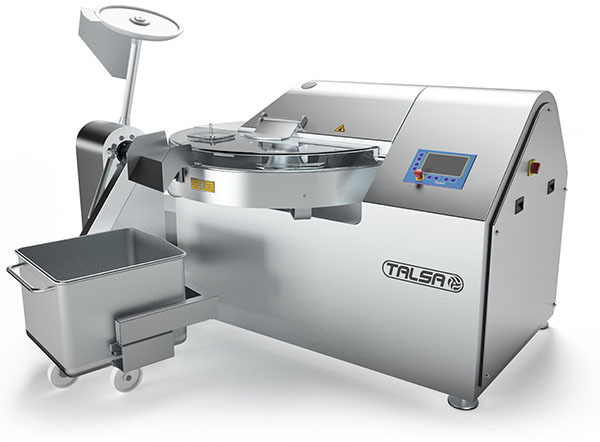 The TALSA K120v Electronic Industrial Bowl Cutter is designed for the production of sausage hash of all kinds, for large slaughterhouses and industrial meat processors. The K120v bowl cutter or bowl chopper is also suitable for a wide range of poultry, fish, pastry or vegetarian products, processed cheese and many commodities in the food processing industry. Bowl cutters – choppers range in size from table top units to extremely large industrial bowl cutters – choppers and are one of the most versatile food processing machines. They are also called Buffalo Cutters or Buffalo Choppers. The TALSA K80v Electronic Industrial Bowl Cutter is designed for the production of sausage hash of all kinds, for large slaughterhouses and industrial meat processors. The K80v bowl cutter or bowl chopper is also suitable for a wide range of poultry, fish, pastry or vegetarian products, processed cheese and many commodities in the food processing industry. They can be used to prepare meat products to become chopped or emulsified for use in a variety of sausage products, vegetables for different types of salsa, different nuts and dried fruits for humus, butters, fruit paste as well as cheeses for cream cheese or with a few adjustments prepare a large batch of scrambled eggs or turn surplus dried bread into croutons. Bowl cutters – choppers are the commercial and industrial version of the home food processor. Options such as variable speed cutting blade motors and reversing blade motors (used to mix rather than cut product) as well a loading and unloading systems allow bowl cutters – choppers to be configured to meet a variety of commercial and industrial processing needs.